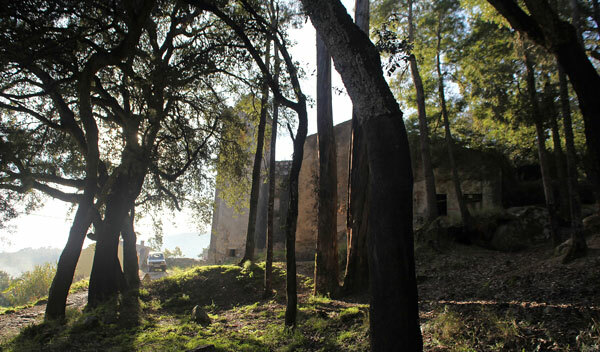 Travel along a peaceful, windy and beautiful road from Portimão (N266), passing through several quiet and unspoilt villages – many with small ‘prato do dia’ local restaurants at the roadside – and admire the cork trees and open countryside that will lead you to Monchique. Monchique lies in the saddle created by the two high hills in the Monchique mountain range, Foia (902 metres) and Picota (773 metres). 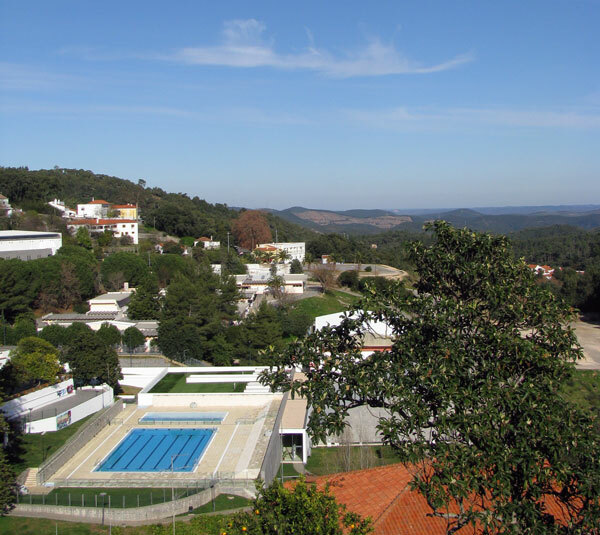 Foia is the highest point in the Algarve region and on a clear day you can see Cape St. Vincent in the west, Faro in the east and the Serra da Arrabida, near Lisbon, to the north. It is often a lot cooler up here than down at the coast – and you can even witness snow on the peaks sometimes! 83% of the area has been declared a Natural Protected Reserve – and it is a wonderful place to enjoy fantastic views, flowers and trees, and wildlife, especially birds. 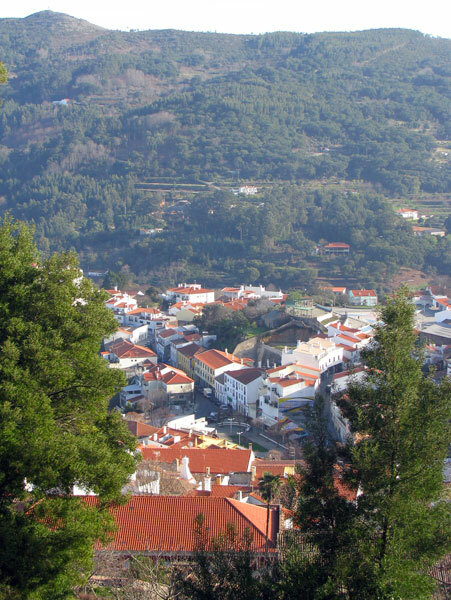 As you drive up to Monchique you will go past the spa of Caldas de Monchique – more about that later – for now just watch out for the slightly hidden left turn to the village (just past the new posh spa hotel Longevity Wellness Resort on a newly built roundabout!) as you drive up to Monchique. The ‘city’ – it feels so much more like a village that I am struggling to call it a city! – is unspoilt and untouched by either time or 21st century progress. It is a place to wander, explore, sit and watch the world go by slowly; and take a deep breath of fresh mountain air. Monchique’s central square has a small paved area with benches, trees, statues and tiles, a few cafés and shops, sculptures, and a pretty water feature with a Moorish-style water wheel. Most attractions lead off from the square and this is a good base to work from. Be warned – there are some steep cobbled streets and hills to overcome if you want to fully explore this lovely place! There are even three swimming pools – one indoor and two outdoor – which you can see from the square and are apparently free to use in the summer. They are next to a large secondary school for the region. 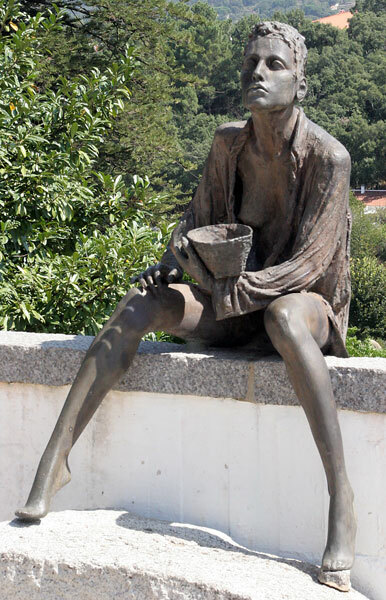 The name Monchique comes from the Romans who named it ‘Mons Cicus’ and the Romans also built the spa at Caldas de Monchique; however Stone Age prehistoric tools have been found in the region proving ancient settlements were in this area of Portugal. 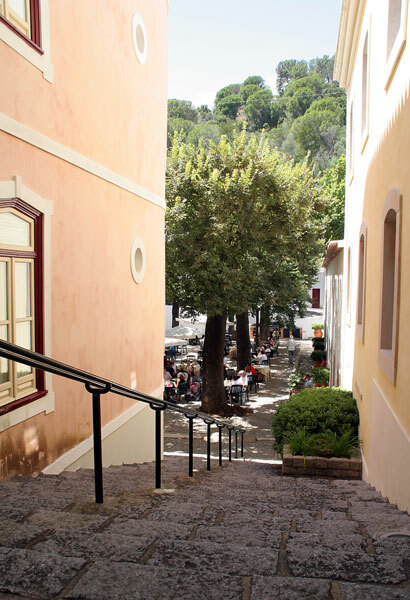 There’s a big gap in history then until King José II elevated the town of Monchique to the rank of city in 1773; and like so many other places in the Algarve, it suffered heavily from the 1755 earthquake. There is also a nice courtyard art studio off the main square (up some very pretty steps) which has mainly pottery for sale. 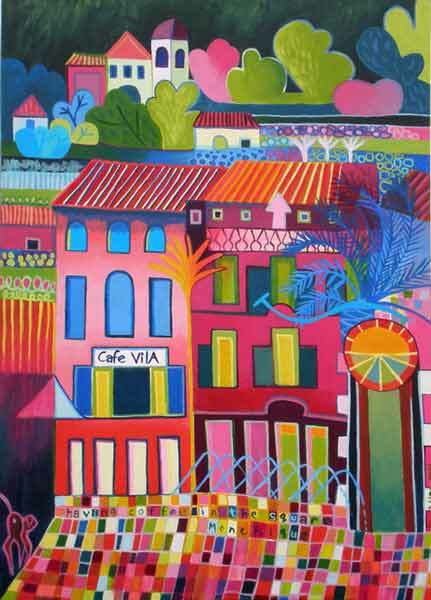 A local artist Liz Allen also has her studio nearby, painting modern, almost abstract colourful landscapes of the local area – check out her website for details of her studio and work. 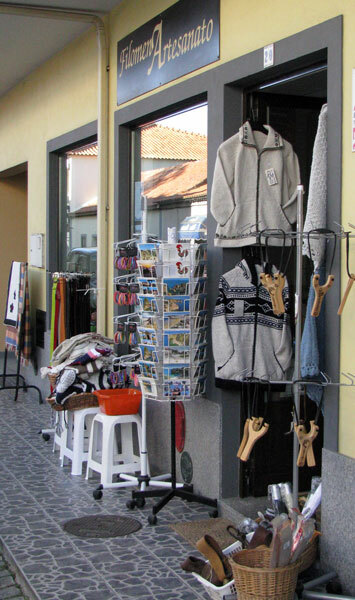 Historically the area was known for its weaving of wool and linen; it now relies more heavily on a wider set of crafts and produce for its tourism, including its famous ‘scissor chairs’ – which are reputed to originate from Roman times, and are a peculiar folding X shape made of wood. You can also buy local honey and there are many cakes and biscuits baked with honey which will tempt you – and which taste wonderful with a coffee! 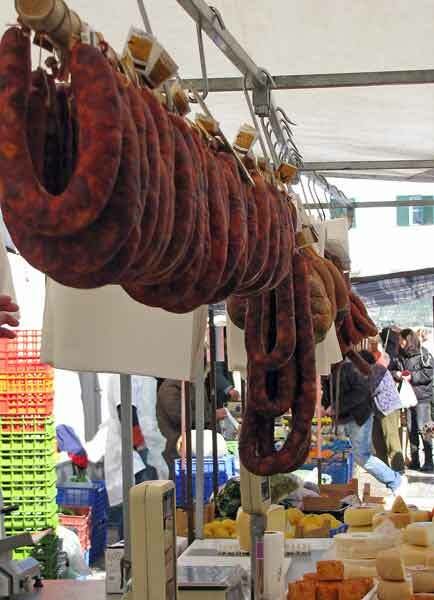 They also have an annual Traditional Sausage Festival – this year it is on the 3rd and 4th March – a chance to promote and sell the traditional sausages of the Monchique region. 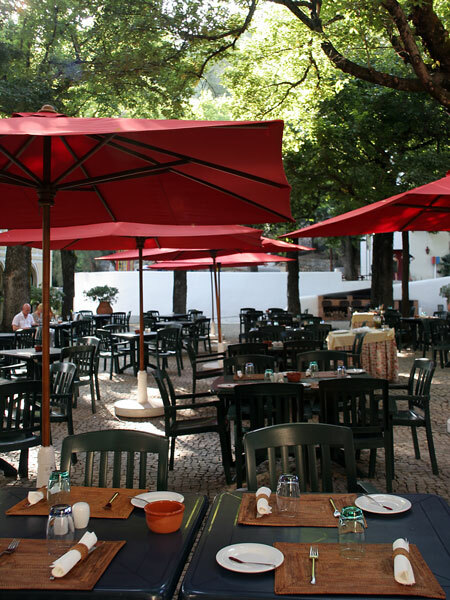 Monchique itself is not the best place to have lunch in my opinion – there are just lots of snack bars selling toasted sandwiches and burgers. We found a little local restaurant that did a very good Bacalhau with chickpeas – ‘prato do dia’ all-in for 6.50 Euros – but you may want to stop off in one of the villages on the way up to Monchique if you want to be more adventurous, or spoil yourself at the lovely restaurant at Caldas de Monchique. 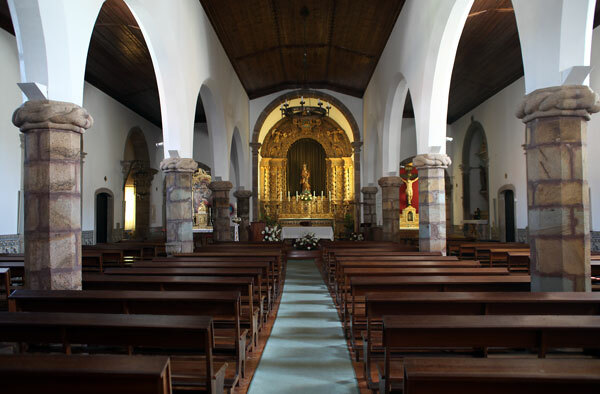 This is the main parish church of Monchique – climb up the hill with its wide stone steps off the main square and it suddenly comes into view on your right, down a small side street. 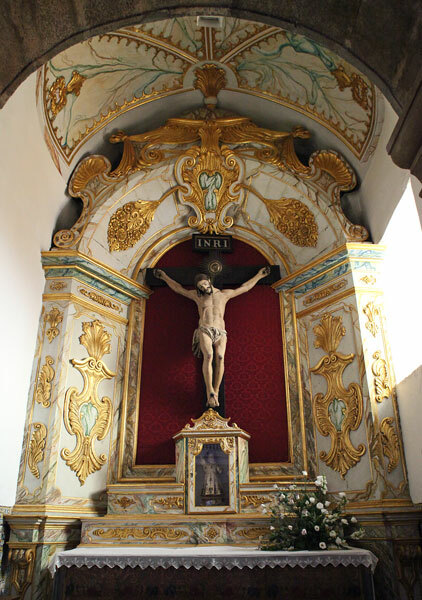 It is dedicated to Nossa Senhora da Conceição, Our Lady of Conception, and was built in the 16th century. 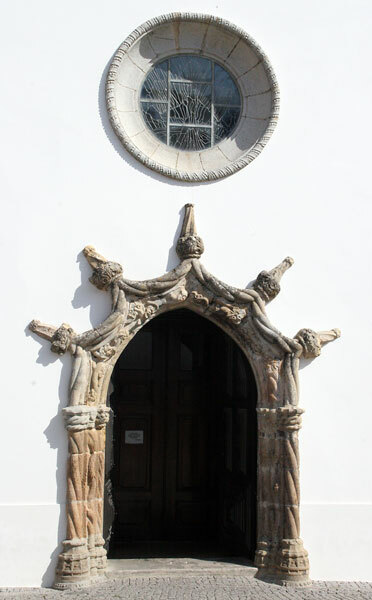 It has an elaborately decorated Manueline front door, featuring stone columns that resemble a knotted rope – a theme repeated inside the church. The three-nave interior has thick granite columns which support the magnificent wide arches. 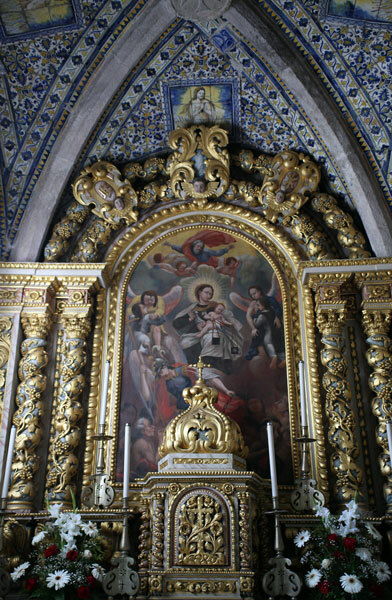 The Capela do Santissimo (Chapel of the Most Holy Sacrament) has wonderful 17th century tiles and a domed ceiling; and the altarpiece of the Capela da Nossa Senhora do Carmo (Chapel of Our Lady of Carmel) is believed to have come from the Convent nearby. This is a small 16th century church – that we have never been able to visit (it’s always closed!) – so please let me know if you ever manage to see inside it! Please see our separate post ‘Convent in Exile‘ for lots more information and pictures of this ruined and abandoned convent. 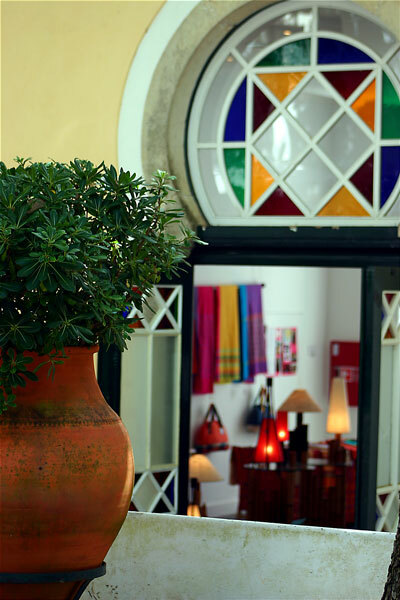 This is a charming 19th century village retreat, famed for its restorative sulphur hot spring waters and gentle charm. There is a central square, shaded by trees, a few small craft shops, a café/bar, one very nice restaurant and some fascinating 19th century houses with distinctive and unique roofs. There is also a small chapel, the Santa Teresa; and picnic benches within a woodland walk. Although the village is mainly known for its posh spa hotel – there is nothing to stop you visiting and wandering around the village and enjoying the peace and quiet of the area. The restaurant (1692) is delightful – it’s not cheap – but it is a real treat! You can also sample the soft and pleasant water with your meal, and it really does taste very nice. You can also watch the staff fire up the giant barbeque to grill the fish for you – the smells wafting over are very tempting! The sulphur hot spring waters are purported to be both medicinal and healing – and it is reported that centuries ago both the King of Portugal and the King of Italy visited the springs. 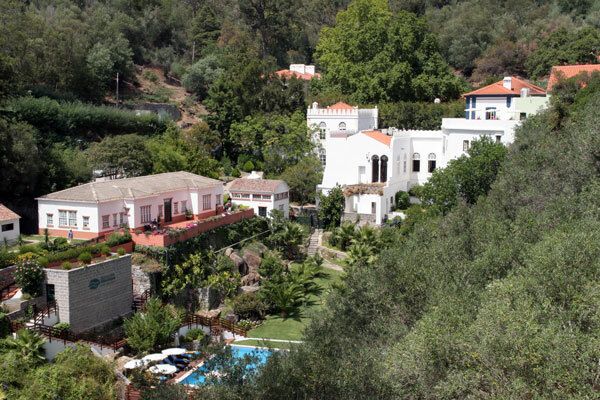 The Villa Termal das Caldas de Monchique offers a year round variety of well-being programs, thermal treatments and Golf & SPA programmes; all situated in beautifully restored historical buildings. 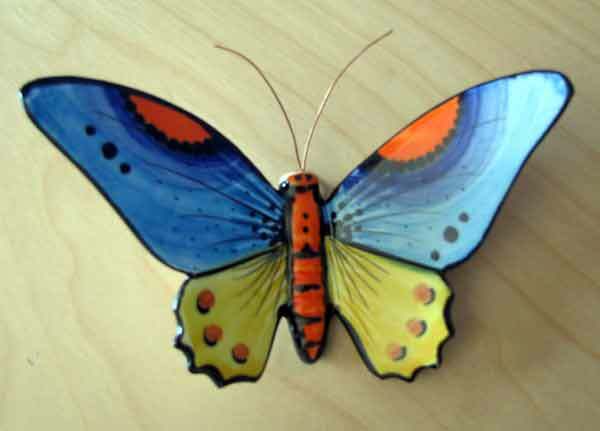 There are also small rooms open to the public which often have wonderful art and craft stalls with local goods and crafts for sale – I have bought some beautiful jewellery there. So there it is – the Monchique in all its glory – why not step off the beach one day and explore this wonderful unspoilt region of the Algarve? 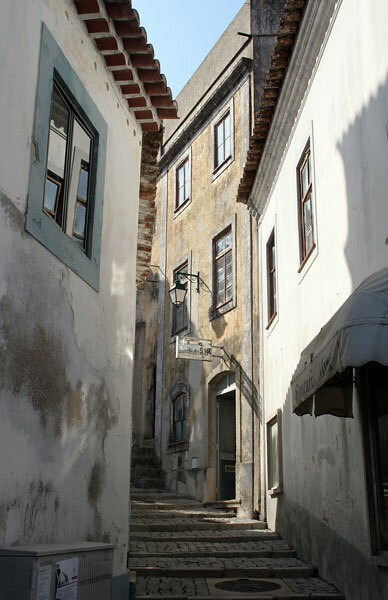 This entry was posted in Places to Visit and tagged Algarve, art, churches, Culture, days out, eating out, Shopping. Bookmark the permalink. Knew it would happen one day! We haven’t done Monchique! 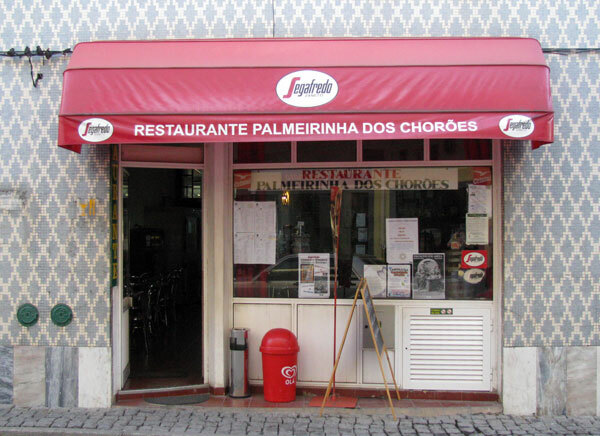 Been to Caldas and up to Foia but sidestepped Monchique. Love that first statue you’ve pictured. Don’t know if I can fit it in next week- still trying to decide which Carnaval procession to go to and whether to do Pancake Day at Armacao. ah now you have to go! Loule Carnaval is supposed to be best? What a great overview of a place that I haven’t been to in many years! Thanks for this. I will keep in mind for the next Algarve itinerary! you’re welcome! I like trying to ‘spotlight’ different areas of the Algarve – often away from the obvious tourist beaches! 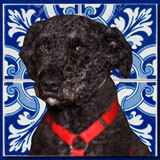 Hi Alyson, Thank you for subscribing to my blog. I just found out you were the creator of the ABC Award. I will be updating my blog post about this award. Sorry! I just read your blog and look forward to seeing more of it. Your award has inspired me to follow your example and one day each week I will devote my post to a letter to hightlight. Thank you again. you’re welcome! I’m not terribly precious about the award – it’s just nice to see it travelling so far and wide – and I do get to find some lovely new blogs each time it is ‘pinged’ back to me – so thanks for offering to add the link back to my site. If you are interested in the A to Z Challenge – then please head over to the website http://myatozchallenge.com/ and Register your blog! It links to our Facebook page group too https://www.facebook.com/groups/152751094838152/?bookmark_t=group – and each time you post onto the website it will automatically link your post to Facebook and Twitter too! Monchique was never a city, Monchique is a Town!